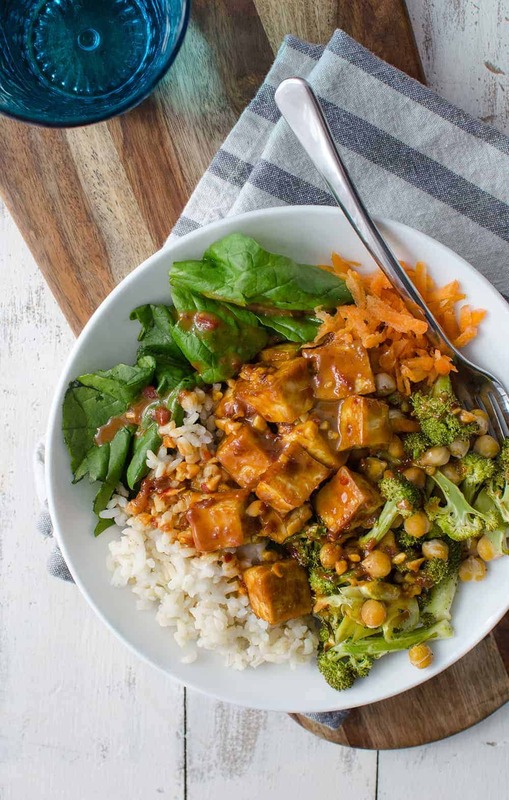 Peanut Tofu Buddha Bowl! A healthy lunch or dinner, perfect for the New Year! 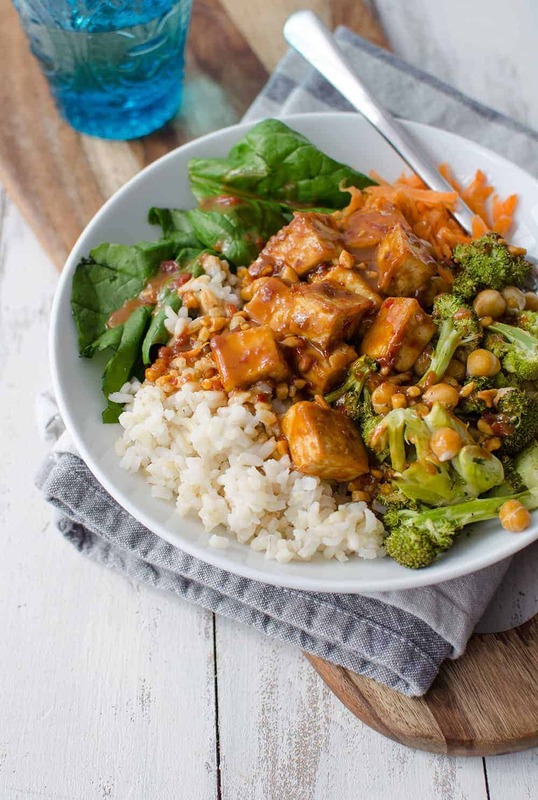 Brown rice, the BEST tofu, vegetables and roasted broccoli in a simple peanut sauce. Is there such thing as vacation coma? Even though BL and I arrived home from our New Zealand trip earlier in the weekend, I feel like I’m been in a foggy daze for the past 48 hours. A mix of insomnia, apathy, fatigue and excitement. We arrived back home late Friday night, wired with caffeine and buzzing from the post-vacation high. After plowing through 5 episodes of Making a Murderer (obsessed) with take-out pizza, we greeted the sunrise by finally heading up to bed. I’m relishing these moments of zero-responsibility. Sure, there are suitcases to unpack, emails that need responding, and a zillion other to-do tasks, but right now I just want to ease back into the busy pace of life as slowly as possible. Of course, when your vacation ends on New Year’s Day, there’s a slight sense of anxiety that follows. Is everyone making plans and goals without me? It seems like my facebook, twitter, insta, whatever has been taken over with pledges to do better, be better, look better. I totally get the desire to want an overhaul come January 1st. I’ve spent the last three weeks sustaining on take out, cheese, and more Sauvignon Blanc than I’d care to admit. I’m sure there were vegetables in there somewhere but when you are relying on restaurant meals three times a day, healthy isn’t always what you get. Once BL and I finished polishing off the last of the pizza, I got up the courage to head out to the grocery store to put together something that would nourish us both. These buddha bowls are my favorite way to get back on the healthy eating track. They are packed with nutrition, flavor and contain enough protein and fiber to keep me full for hours. Exactly the kind of fuel I need if I plan to continue my Netflix binge. This tofu. Please try it. Please try it. Make this your New Year’s resolution, the year you will love tofu at home. I forget where I learned this technique but it’s pretty foolproof in creating chewy, crispy chunks of tofu that aren’t drenched in oil. To achieve the faux-fried texture, bake the tofu until it’s almost dry then marinate in peanut sauce! Lightly saute the marinated tofu in more sauce until hot and crispy and then pile on top of cooked grains and vegetables. Or eat the entire thing straight out of the skillet. I’ve done both and they are equally good. While we are on the subject of New Year, New You, can we pledge to enjoy food more? It’s almost impossible to have a healthy relationship with food with the words Master Cleanse, detox, diet or fasting. I can almost promise that those fads will leave you hungry, unsatisfied and more hard on yourself. There is an easier way. Love food that loves you back. Fill your plate with colorful produce, lean protein, healthy fat and complex carbs. Eat until you are satisfied, enjoying each bite with acceptance and not punishment. I plan on sharing more of my thoughts on this idea later in the week but for now, these buddha bowls await. Watch How to Make these Vegan Buddha Bowls! 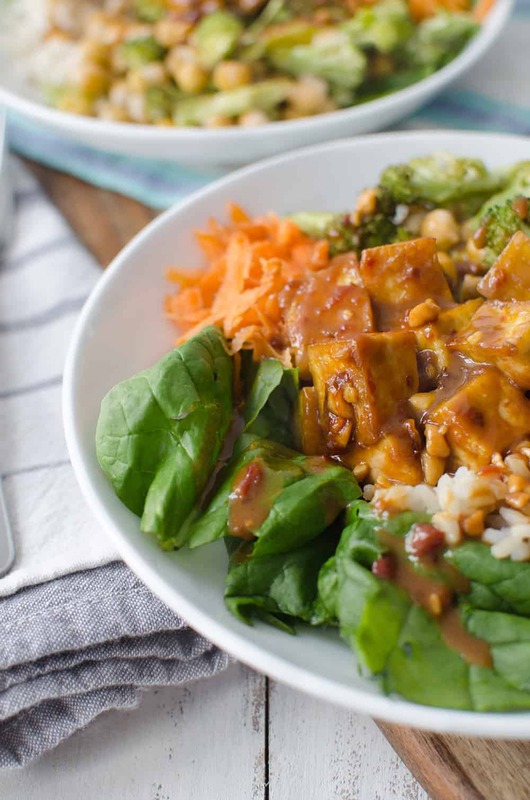 Peanut Tofu Buddha Bowl! A healthy lunch or dinner, perfect for the New Year! 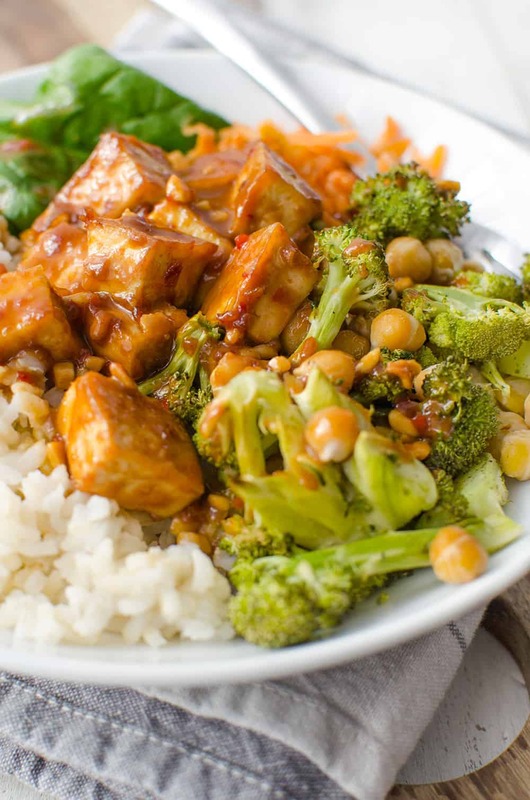 Brown rice, the BEST tofu, vegetables, roasted broccoli in a simple peanut sauce. Vegan and Gluten-Free. Preheat the oven to 400 degrees F. Cube tofu and place in a single layer on a non-stick baking sheet and cook for 25 minutes. If you aren’t using a non-stick baking sheet, lightly spray with cooking spray. Remove from oven and place in a shallow bowl. Thank you! Yes, I’m working on a few recaps! Hope to post later this week! Great post! “Love food that loves you back” – so, so true, love that line. I always struggle with making tofu at home even though I really enjoy it, and this method sounds so good! You had me at peanut sauce. This method really is foolproof. I make tofu a ton at home and the only way I really LOVED it was when I fried it in a ton of oil. Delicious, but not the healthiest. Baking it, marinating it and then lightly sauteeing is perfect! I’m going to post more recipes in the coming month with more tofu hacks! Love food that loves you back…I LOVE it! Hehe, when I first got to England, I was definitely relishing my moments of zero-responsibility, too. It looked like you had such a good time in New Zealand! I need to try baking tofu more. I usually pan-fry it to get it crisp on the outside, and then mix the tofu in a sauce. This bowl looks absolutely delicious! I love following your travels in England! Instagram makes the best travel diaries! Yum, this looks so delicious. It reminds me of my favorite peanut tofu from a vegetarian restaurant in my hometown. Also, my husband and I are obsessed with Making Murderer as well! In fact we just watched the last episode last night, I don’t know what we are going to do now… Anyway, pining this! It’s incredible. I’m so happy that my jetlagged coincided with it’s release 🙂 It’s been haunting me ever since! Have you started the new Serial? I’m waiting for all the episodes to be released so i can binge watch it. Maybe your daze is something to do with Making a Murderer? I’m so conflicted!! Anyway, this Buddha Bowl looks fab. Perfect for the new year- healthy, nourishing and filling! love food that loves you back! What a great expression! 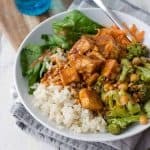 This recipe is totally motivating me to eat more tofu! I’m not a huge tofu person, but when it’s covered in peanut sauce I think I will love it! This sounds awesome – I’m adding it to my menu plan for this coming week! totally with you on baking the tofu before sautéing- i find it sticks terribly to the pan otherwise! Thank you for sharing your amazing recipe, I love the sauce! I’m not sure if I missed something, but did you mean “olive oil” in Step 4? I used the 2T of sesame oil in the sauce & figured you meant olive oil to sauté the tofu? Making the recipe now and was also wondering about the sesame oil. Was it supposed to be in the sauce? Yes, in the sauce! I will update the directions now so that it’s clear. I apologize for any confusion! No worries! We made it last night and it was delish. I added the rice to the pan with the tofu and tossed it all together with the veggies and added an egg so it was more like a fried rice. Super yummy! That sounds amazing! I need to try this! Yes, I did! I’m sorry about any confusion. Fixing it now! So sorry! Love hearing this! Thanks for sharing Lopa! Seriously the best at home Asian I’ve ever made! The sauce is so flavorful and the raw vegetables help to keep it fresh. Great dish for Lent! So glad you liked it! Thanks Gavin! Tried this tonight! Despite being a vegetarian, I had never – ever – pressed my own tofu. I know. So that part was a new experience! I’m sure I can do better if I take more time with it. As it is, it turned out well! I sauteed the broccoli instead of roasting it to save time, used jarred peanut sauce for the same reason (I’ll try your recipe next time), and added some Goddess dressing on top because I’m obsessed with the stuff. Overall super yummy! Erin, I recently bought a tofu press on Amazon. It works great, and makes the whole process faster and easier! Completely agree! I love my tofu press and if you are eating tofu often, it’s a great tool to have! Just made this! It was very very good. The sauce is so yummy. I never thought tofu and broccoli could taste so good. I loved how they were roasted 🙂 5 star recipe, thank you! Excellent- glad you liked it! Thanks for sharing! Awesome! Thanks for sharing! Glad you liked it! This was a very easy-to-make, tasty dish. The peanut dressing was delicious, though sweeter than I was expecting. My husband loved it and even my 15-month-old ate all his broccoli with the peanut dressing. Omg this looks amazing! I need to eat it. 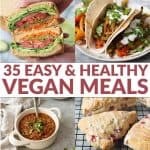 How does this only take 35 minutes if the tofu cooks for 25 and the broccoli for 20?! Hi April, I recommend cooking the tofu and broccoli together to cut down on overall cooking time. One of my new faves! Making it again, it’s awesomely delish! Made this tonight and it turned out very well. Thanks for sharing this awesome recipe! Love hearing this! Thanks Marina! Oh my god I’m making this again. One of my favorite new recipes in a long time!!!! So good! SO glad to hear this! Thanks for the comment. We had this tonight…sooooo delicious!!! I made my tofu a couple hours before dinner, and that was a big mistake! By dinnertime, what was originally crispy on the outside and soft in the middle was hard and chewy. Flavor was delish!!! Will definitely be putting this in our regular rotation. (I do think I will cut down on the maple syrup a bit and ramp up the chili sauce. I also added 2 cloves of garlic to the sauce and thought that was good. Thanks for posting! This recipe was so good! I just learned a new way to ‘fry’ tofu! I sauteed the spinach with the tofu and the marinating sauce. This looks delish! 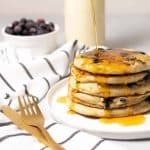 Do you have the nutritional breakdown for this recipe? Recently became vegetarian and this is our favorite! Thanks for the recipe! So glad you like it! Thanks Elena! HI there. Found this on Pinterest and made it last night for the family. Really delicious and easy to make. Thanks so much for sharing it. Hi there! Recipe looks great! I can’t wait to try it this weekend. Any chance if you know if this keeps as leftovers for a day or two or three? Thanks so much for the great meal ideas! Thanks Cammie! You can keep this one for a few days as long as you don’t mix it together first. So- prep the vegetables and keep them in a separate container, same with the sauce and the tofu and the rice. Then- when ready to eat- heat and mix! So glad you enjoyed it! Thanks for the kind comment. Tried this tonight, and it’s absolutely wonderful. My favorite part is the peanut sauce which tastes almost exactly like peanut sauce I used to have in my favorite Vietnamese restaurant many years ago. I’ve been searching for the recipe, and this is very close. I’ll definitely make this again. 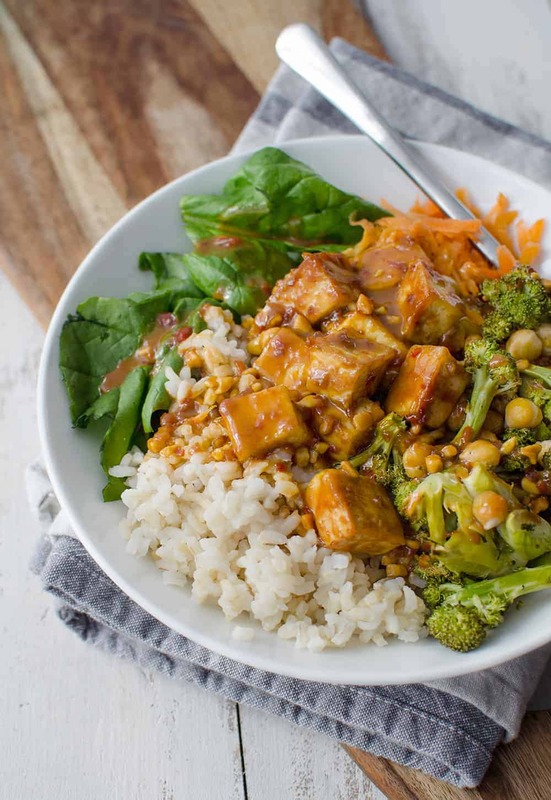 This peanut sauce is just delicious with tofu and veggies….we loved it. THIS DISH IS DELISH!!! Made it for myself so divided all the ingredients by 4, added some cavolo nero and used bulgar wheat instead of brown rice and it was so tasty!! Will definitely be making this dish again! This recipe is fantastic. My husband and I loved it. Thank you! I made this last week and it was delicious! The sauce is so yummy. Thanks for the great recipe. I’ll be adding this to my regular meal rotation! Thanks Katherine! So glad you liked it! my favourite buddha bowl! thank you. So glad you liked it! Thanks Lisa! Made this tonight. It was excellent! So glad you liked it! Thanks Aimee! Good. PS- in the instructions the chickpeas disappear from the instructions and then are replaced with beans. This is my most favourite Buddha bowl in the whole entire world!!!! This is the most delicious tofu sauce everrrrrrrrrrrrrrrrrrrr. I’ve made this recipe 5+ times and tonight I think I’m gonna switch it up and make it with quinoa. Oh boy am I ever excited!!!! Thank you SO much for this. This was crazy good! I’m not a vegetarian, but I love tofu when it’s done right and I try to eat as healthy as possible. Anything with whole grains, loads of veggies, and great tofu is bound to catch my attention. This was so amazing! I only wish I had made more because I wanted to eat this non-stop! Only issue that I had is that the timing is off. Cook time is listed as 15 minutes, but the tofu alone bakes for 25. Thanks Megan! Yes, I need to fix that. Thought I did earlier, but will do it again now. So glad you liked it! Thanks Hollie! Thanks, Alex. I am ridiculously excited to have made that Buddha bowl and like the tofu. I already knew peanut sauce was a win and yours is excellent. I had my tofu cubes on the small side so there were plenty chewy which is fine but next time I think I will try to make them a little bit bigger. I will check out those other recipes for sure! Thanks again! Thank you, Alex! I am ridiculously excited to have made tofu that turned out great. Love the peanut sauce, too. So good. I will check out the recipe links you sent and I appreciate that very much.My tofu cubes were on the small side so the texture was definitely chewy but that is better than tasteless and mushy. This recipe had great flavor. Thanks again! Ok, couple of things. First, this is a fantastic way to cook thr tofu, it had some nice texture on the outside from the bake. Secondly, I have tried countless peanut sauces and this is BY FAR the best one I’ve tried so far. My husband puts this on literally everything now!